My hubby went out to dinner with a pal the other night and I really couldn’t bring myself to get dressed in real people clothes, put on the mask that we all wear in public and walk to the market to buy groceries. A quick rummage in the garden and a couple of pantry staples and I had a splendid repast for one. 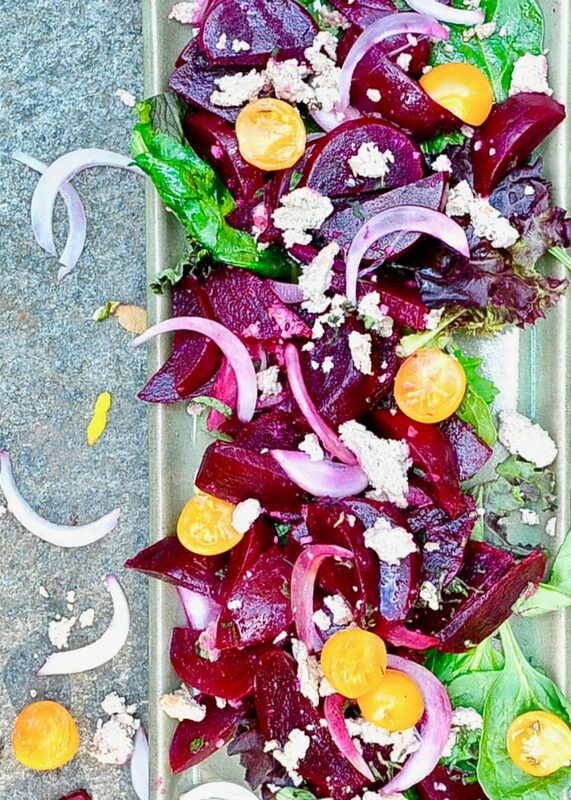 All those baby beets took were a quick roasting to bring out their sweetness, a toss in some garlicky oil free vinaigrette and they bloomed with flavor. I crumbled a generous amount of my almond feta cheese for salty, umami creamy yumminess. We’ve all seen that child who throws a complete fit when they leave a friend’s house. You know; the one who falls to bits and pieces on the floor like a pile of shattered glass. One who is so difficult to coerce that the mom has to call in dad in to carry the flailing creature out of the house because the host family has basically sat down for dinner and washed their hands of the whole scene and are regretting ever suggesting the playdate in the first place. Sometimes that red faced monster child will grab a hold of a door frame and some one will need to literally pry their white knuckled fingers off while plying them with bribes and threats. Just stop crying right now and you can watch an extra show tonight. 1…2…They will never let us come back if you keep this up! You’re embarrassing me, please, let go for mommy. I’m cancelling our trip to the beach tomorrow. Here’s the thing. I am that child. I refuse to let go of summer as it segues into fall. I am holding tight to long days and warm nights as Autumn pries my fingers one by one from green canopies and buzzing bees. I hear the whispered promises of fall foliage and apple picking but can’t let go of watermelon mornings and hydrangea blossoms. What’s a girl to do who is stuck betwixt and between? Sir, it’s always beets, The answer is beets. If you are a salad lover then try my hearty Niscoise Salad with orange glazed tofu. Or my bright and flavorful Watermelon Salad with Strawberries and Mint. 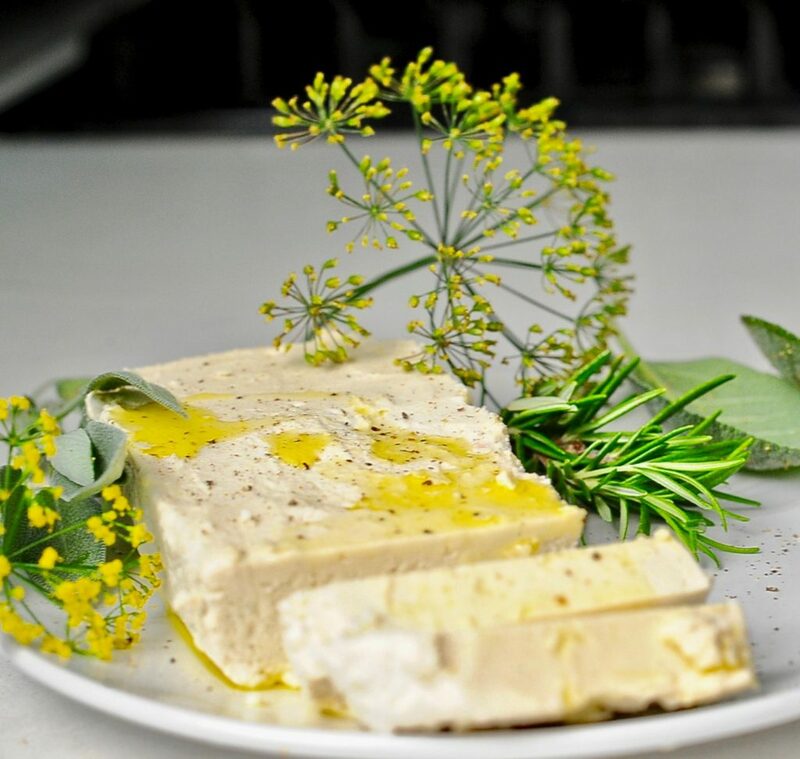 I used this succulent Herb Marinated Feta Cheese recipe and broke it into chunks over my salad . Yum. 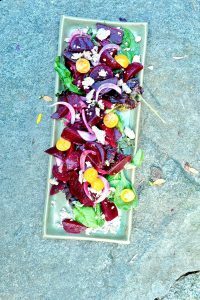 A quick and easy beet salad with a garlicky oil free lemon vinaigrette that takes advantage of the bounty of summer.Toss on some vegan Fata and you have a show stopper of a main dish salad. Heat your oven to 400 degrees Fahrenheit. Place your beets in a small oven proof casserole and cover with the lid. Place in oven. Start checking for doneness with a sharp knife after about 40 minutes. You want them tender not mushy! Ewww. Allow them to cool and peel them. You should be able to slip their skin of with your fingers. Blend together all your marinade ingredients in the blender.Thin with more aquafaba to desired viscosity. 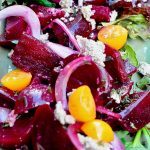 In a large bowl toss your still warm beets with the marinade. Now put in the rest of your veggies, give them a good toss and serve with a crumbling of vegan feta. Crumble a generous amount of vegan feta cheese over the top. 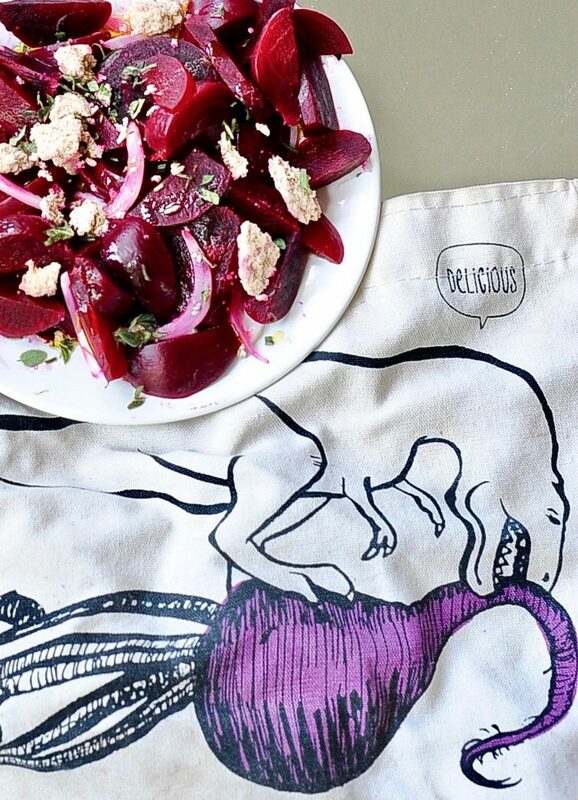 Ok, now I finally know how to properly roast and peel beets for a salad – thanks! My plan is to become fabulously wealthy and follow summer around the globe. Around Christmastime I’d spend a month in a cold, snowy, winter-wonderlandy place, say northern Scandinavia, and then I’d take off and catch up with summer again. I could do without spring or autumn. Those seasons are too heart-breaking..
Jeez Louise Helle. I have been telling the family exactly that for years. One month of real snowy winter is more than enough. I want to live where the farmer’ market is overflowing with tropical fruit. And read beneath a ceiling fan. and walk on golden beaches. and always have sea salt in my hair.